While powerful and luxurious trucks may be one of the first things that come to mind when many people think “GMC,” the lineup of GMC SUVs is equally noteworthy. Other companies too-often water down their lineup with a lot of different vehicles, creating a situation where it seems like there are more choices to look at but maybe not a lot of what you need. What ends up happening, however, is that you can easily get stuck trying to choose between two different options that each have some of what you want without any one model that is just right. GMC keeps their SUV lineup nice and tidy, with just three different models to choose from, but within those models you can also pick from a wide range of trim levels and available options. 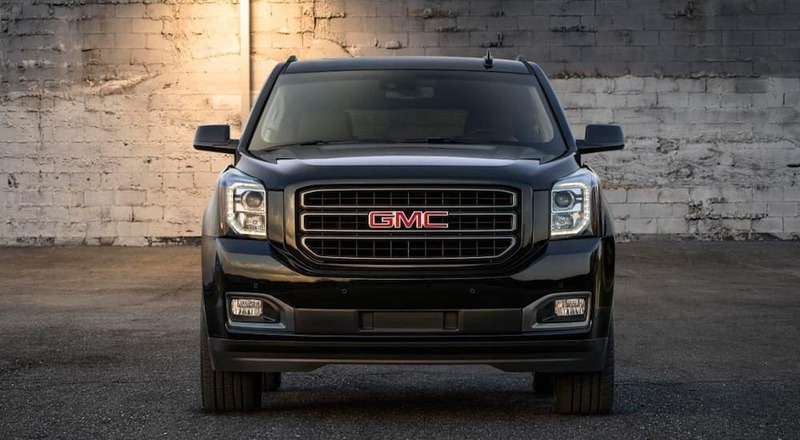 What this does is make it simple to pick the GMC SUV that is just right for you. If you want a small, perhaps even compact SUV, then give the 2019 GMC Terrain a good look, while those interested in a mid-size option should consider the 2019 GMC Acadia, and anyone interested in a full-size SUV can’t go wrong with the 2019 GMC Yukon. Each of these GMC SUVs is available as a Denali version, which offers the highest level of luxury and comfort. Among the lineup of 2019 GMC SUVs, the Terrain is the smallest and most affordable option, but that doesn’t mean it skimps on great features and available upgrades. There are numerous trim levels to choose from with the Terrain, depending on just what you want out of your SUV. The size of the Terrain makes it a great choice if you want an SUV but you do not necessarily have a ton of space in your life for a massive vehicle. We know how it is when you want a vehicle to fit your family and keep everyone safe, even though you’re not looking to cart 9 people around town. Despite its small size, the 2019 GMC Terrain packs plenty of great features both inside and out, including HID headlamps and signature LED lighting that makes the lineup of GMC SUVs stand apart on the road. The interior is quite spacious for a small SUV, with seats that fold flat so you can utilize all that room in any way you need. There is built-in Navigation available and a traction select system that lets you make real-time adjustments to the vehicle’s traction to match driving conditions. There’s room for 5 inside the Terrain, which has a maximum towing power of up to 3,500 lbs. and up to 252hp available. 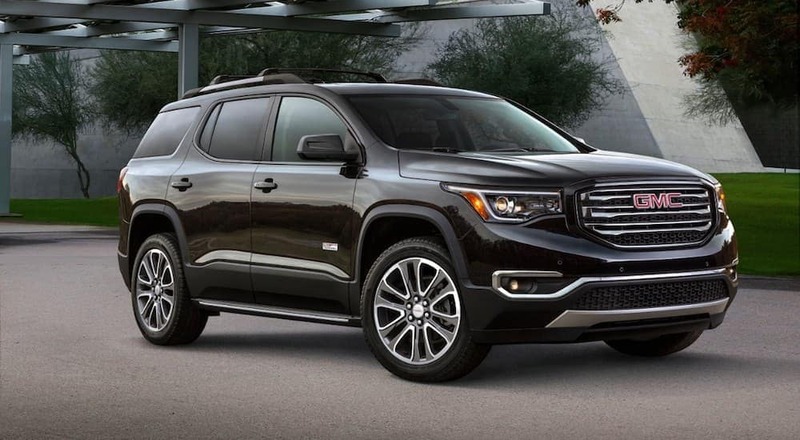 If you need something bigger than the 2019 GMC Terrain but still don’t want a full-size SUV, then the Acadia is a perfect middle-of-the-road option. As a mid-size SUV, the 2019 GMC Acadia gives you plenty of space inside and lots of power to get a wide range of jobs done. But you don’t need to make quite as much room for it in your life as you do for a full-size SUV like the 2019 GMC Yukon. Within the GMC SUV lineup, the Acadia is the “just right” for a wide range of drivers with large families or groups of friends. The Acadia has comfortable seating for up to 7 people and is not even an inch higher than the Terrain, so it’s a great fit in any garage. There are three rows of seats in the Acadia, and the second row slides to make access to the third row easier, so you can get everyone loaded into and out of this SUV with little commotion. The entertainment package on the Acadia is compatible with Apple CarPlay and includes available Navigation. With the right setup, the 2019 GMC Acadia can haul up to 4,000 lbs. and has a maximum 310hp available. While the Terrain and Acadia are both great SUVs, we know that there are some drivers out there who are not interested in small and mid-size options, but want a full-size experience. For you, there is the 2019 GMC Yukon, which is a massive, beautiful vehicle that is ideal for large families, big groups of friends, or just loading up with camping gear to get away for the weekend. As a full-size SUV, the Yukon is definitely not for everyone, but it is the ideal choice for people who need a lot of seating for passengers and room for cargo. Plus the Yukon has great towing capacity and a wide range of safety features. When you see the 2019 GMC Yukon, there is no doubt that this is a full-size SUV; it is almost a foot taller than the Terrain and nearly two feet longer. But that larger size comes with a lot of great features, including room for up to 9 people, a ton of leg room for all passengers, and plenty of cargo space. When properly equipped, the Yukon can haul up to 8,400 lbs. of trailer cargo, making it the strongest of the GMC SUVs on the market, and can have up to 420hp for incredible power. When looking at different GMC SUVs there is one thing that deserves special attention: the Denali trim level. This is available on all three SUVs and provides a pinnacle experience when it comes to luxury and comfort. Choosing the Denali means you get a unique chrome grille and exterior accents that set it apart from all other GMC SUVs on the road, along with wood accents in the interior, leather-appointed, heated, and ventilated seats, and leather features throughout the cabin. You really have to see a GMC Denali vehicle and sit in it for yourself to fully appreciate just how incredible the experience truly is. The Denali is an absolute joy to sit in, but also includes a massive suite of safety features, which can vary from one GMC SUV to another, but are always the best of what is available for any particular model. Features like a Bose sound system are great, but the main reason we show everyone the beauty of the Denali is that it can keep you and your loved ones safe on the road. For example, the 2019 GMC Yukon Denali includes features like low-speed forward automatic braking, front and rear park assist, forward collision alert, and lane keep assist with lane departure warning. Choosing Denali doesn’t just look and feel great, it helps protect what is most important to you. At Carl Black Kennesaw, we are about more than just trying to get you to buy a car, truck, or SUV and call it a day. For us, selling a GMC SUV is about building a relationship with a customer – one that will last for years to come and we work hard to make sure you always drive away happy. That’s why we are so excited about the lineup of 2019 GMC SUVs, because it’s easy to ensure you will be pleased with your vehicle whether you want something small, mid-size, or a massive ride with room for a football team. Don’t just take our word for it; come visit us, see the GMC SUV lineup for yourself, and then let us help you figure out which one is just right for you.